I need to replace my convertible top on my Ap2. Any suggestions on which to get? Does the top come with the latches? I looked at the Robbins line and the EzOn line. They both make tops for the S2000 and both make them in either vinyl (same as the OEM) and StayFast fabric. The installers with whom I have spoken say that the Robbins has a slightly better fit but both are acceptable. However, the color selection is very limited in both of those materials. Only black and blue are available and neither company would make a custom top in any other color. While Robbins makes TwillFast tops for exotic cars like Ferrari, they don't make them for the S2000. EzOn does not offer the TwillFast at all. I did find a company in California (www.kwiktops.com) that had a vendor that would custom make a TwillFast top for the S2000 and from any of the 12 colors in the Twillfast line. Just for kicks, I had them provide a quote even though I fully expected that it would be more than $1,000. To my surprise, they came in under $700. I really wanted a tan top to go with my tan interior. So, I bit the bullet, even though that price was nearly double that of a vinyl EzOn. The fit was and continues to be PERFECT. We noticed a minor flaw in the rear window's seal during installation and they had a new top delivered three business days later free of charge and they covered the cost of the reinstall. WOW! No, latches do not come with the top. You must buy latches from Honda. Actually, it does count. I've spoken to two guys that install tops and they say that the easiest to install is the OEM. If I had not wanted a special color, I would have probably gone for OEM or a Robbins Stayfast in black. Last edited by L8Apex; 08-18-2013 at 07:02 AM. Yeah, one of techs actually did it, turned out perfect. He took the metal burrs off the frame so it won't tear again. How much is Oem for us none employees? Online purchases before shipping ought to be in the $850 zone. I'm guessing that my cost is around $800.00 up here in Canada. There were two of us. The lead had done several OEM S2000 tops prior to installing this custom top. The difference between an OEM and a custom top is that the custom top does not come with a rain rail. You must remove the rain rail from the existing top and rivet it onto the new, custom top. Last edited by L8Apex; 08-18-2013 at 04:02 PM. 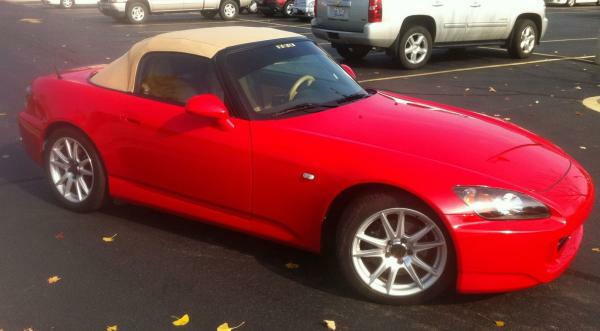 Wheres a good place to get my convertible top replaced for my S2000 in the Metro ATL? Quick Reply: Which convertible top is good?